Fall and the holidays are coming up and I can hardly wait for the gorgeous leaves to turn colors and drop! There are SO many outdoor and indoor activities that you can do with leaves! 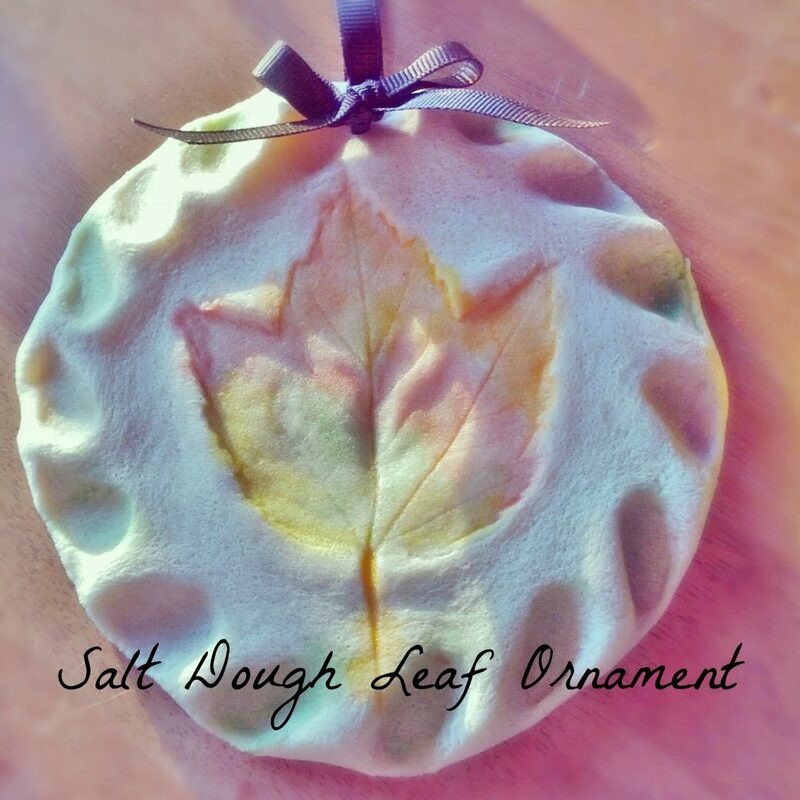 We absolutely LOVE the way our salt dough leaf ornament turned out! It’s the perfect sensory activity for kids and they can turn their creations into wonderful handmade gifts to treasure for years to come. Grab a few leaves and the supplies below and get started! 1. Collect a variety of leaves in different shapes and sizes. The color will not matter as they will only be used to make your impression. 2. Preheat your oven to 100C/200F. 3. Mix the salt and flour together. Slowly add the water, starting with just under ¼ cup. Knead the mixture until a dough consistency begins to form. Gradually add the remaining water (more if necessary) until you have a “play dough” type consistency. 4. Roll out the dough to approximately ¼” thickness and cut out using your circular cookie cutter . Make sure that the size is large enough to accommodate the leaf you plan to use. 5. Transfer the dough cut out to a parchment paper lined baking sheet. 6. Gently press your leaf into the dough. You want to apply enough pressure that the edges of the leaf and the veins are well defined in the dough. Remove the leaf. At this time you can also add a decorative edge to your ornament. An easy and attractive option is to press the dough between your finger and thumb as you would a pie crust. 7. Mix a variety of colors of food coloring with a few drops of water to create a liquid water color paint. Brush a small amount of the mixture onto the ornament where you want to enhance the impression. 8. Using a straw, poke a small hole in the top of the ornament for the ribbon that will be used for hanging. 9. Bake in preheated oven for 3 hours. 10. Remove from oven, allow to cool. Cut your ribbon to the desired length, slip through the hole created with the straw, tie into a bow, hang and enjoy! This makes a great sensory craft to do with all of the leaves that are dropping right now! They turn out as beautiful holiday gifts too! Below are a few great books to help you with your salt dough crafts this year!